Can’t get enough of Ocarina of Time 3D‘s gorgeous screenshots? We’ve compiled them all in a gallery page for your viewing pleasure. They’re sorted out in the order of their appearance, so you’ll be able to browse through the E3 2010 pics and then scroll down for comparison to the GDC 2011 ones if you so choose. They’re posted as thumbnails, but if you click the images you’ll bring up the full-size version in a slideshow viewer. 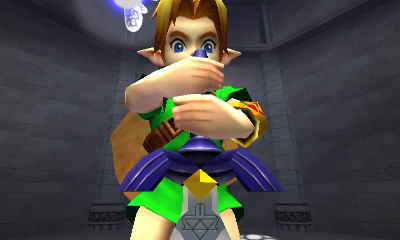 The gallery link has also been posted up on our Ocarina of Time homepage. It’s undergoing a lot of reconstruction right now, so check back periodically – particularly once we’re finished releasing our walkthrough for A Link to the Past – for updates on game content, including story and game guides, screenshots (past and present), and more!